The Wheel is the structure of the Aurbis. The Spokes are "eight components of chaos", believed to be referring to the Divines and the primordial force of Padomay. They are the "lent bones" (i.e. Earth Bones) of the Aedra, those who formed the earth upon which mortals tread and gave them the blending of the primordial forces of Anu and Padomay: static change. Outside the spokes is the Aurbis, though this is probably better understood in context as Aetherius, the spirit realm, the rim of the Wheel. The spaces between the Spokes are Oblivion, the realms of the Daedric Princes. Mundus is the hub. 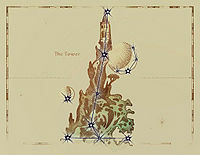 Those trying to find the Tower are seeking to follow Lorkhan's path, to see the "I", except without leaving the Wheel. They are seeking to comprehend wholly and completely the nature of all and their place within, while still being able to comprehend and express their own individuality. If successful, they are said to dance atop (or reside within) the Tower, observing it without fear, which is to know CHIM. [UOL 1] But all who dance atop the Tower change forever the path for those who come after. However, Mundus is the hub of the Wheel, the heart of all creation. Its secret is that this hub is "the reflection of its creators, the circle within the circle". A microcosm allowing one to perceive the Tower without leaving the Aurbis, making it much easier to see. Those who can stand in this flux of reality yet remain whole of mind may look at it sideways and see the "I". This is the secret Tower. [UOL 1] Those who reach a true understanding on the nature of the universe, the nature of the Tower, are sometimes said to know a "Right Reaching". Vivec also wrote of the "secret triangular gate" of the Heart of Lorkhan through which mortals could perceive the secret Tower. According to legend, when the Aedra undertook the creation of Mundus, the physical flesh of Nirn was hung on a skeleton of joints: the Earth Bones. Each of them radiated a palpable reality. The Adamantine Tower was erected for Convention atop one of these joint-points. During the Merethic Era, the Aldmeri devised a way for "Variorum Architects" to inscribe rules for new Towers. They self-refracted, with different bands following different Towers and Stones, resulting in the proliferation of the Towers which are known today, each of them built on other joint-points. These legends suggest that while time was linear in the Merethic Era, it was not singular: by building their own Tower, each group could create their own narrative, distinct but equal to those around it. And so, the Towers did their Dance, each harnessing their own reality and making it conform to their desires. 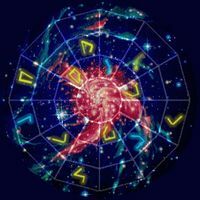 It is speculated that the Towers will conform their spheres of reality according to the desires of whomever claims them (this is offered as a possible explanation for an apparent climate change in Cyrodiil). Tower Zero. Adamantine. Direnni. The Ur-Tower. The tower on the Isle of Balfiera is known by many names. It was the first unassailable spike of reality in the Dawn,[UOL 2] the site of Convention, the single oldest building in all the known world. Legend holds that linear time began around the tower, which defined reality within its Aurbic vicinity, and spread from there in a stepped fashion. 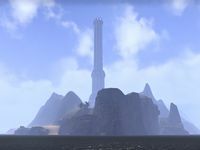 [UOL 2] It was this tower which would be emulated across Tamriel. Architects have noted that building a tower to its proportions should not be possible. Convention consisted of two known decisions: the punishment of Lorkhan, and the decision of Aedra to either leave Mundus or stay and become the Earth Bones. [UOL 2] The "First Tower Dictate" is said to be "render the mutant bound where he may do no more harm. As God of the Mundus, alike shall be his progeny, split from their divine sparks. We are Eight time eight Exarchs. Let the home of Padomay see us as sole exit". At the apex of Ada-Mantia is where Auri-El is said to have slain Lorkhan, impaled his Heart on an arrow, and launched it across the world. Even after the Aedra left, Ada-Mantia continued to dictate reality in its vicinity, bringing unrelenting order to the chaos of the Dawn. The facade has changed over the years, but the core of the tower has remained entirely the same: a single great, seamless, impregnable spire of ageless metal which is at least half-embedded in the ground. It is entirely smooth, except for one point known as the Argent Aperture which is thought to be a door. Adjacent to the Zero Stone, this door has a lock of thirteen slowly counter-rotating rings. It has never been opened. Auri-El launched the Heart of Lorkhan across the world because he could not destroy it. It is the Heart of the World, and merely laughed at his efforts. As the Aedra sought to leave the world for its own good at Convention, the raw power of the Heart was essential in order for the world to survive in their absence. Thus, the Heart became the First Stone to the second Tower. It imbued Mundus with a special kind of divinity: NIRN ("the Gray Maybe" in the language of the Ehlnofey), the consequence of variable fate. [UOL 2] The Dwemer found the Heart buried deep beneath the mountain, and High Craftlord Kagrenac sought to harness its power in the building of a mechanical god for the Dwemer. But that is the story of the Tower of Walk-Brass. Using Kagrenac's achievements, four Chimer eventually tapped into the power of the Heart: the Tribunal of Almalexia, Sotha Sil, and Vivec wielded the divine power of the Heart for thousands of years for the benefit of their people. But when their former compatriot, Dagoth Ur, awoke beneath the mountain circa 2E 882, they became locked in a bitter stalemate with him, and they found themselves unwilling, unable, to do what they needed to in order to win. And eventually, they lost the capability of winning, and instead began losing, slowly. However, with the fulfillment of the Nerevarine Prophecies in 3E 427, Kagrenac's bindings upon the Heart were destroyed: the Heart of the World was set free. 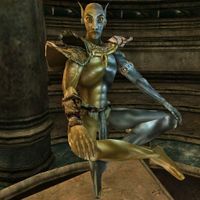 All who had stolen power from it lost their divine spark, and the threat Dagoth Ur posed to Tamriel was quickly eliminated. Unfortunately, this meant that the Red Tower no longer had its Stone. The Red Tower had fallen, and some worried that this cost would be too great to bear, for the barrier between Mundus and Oblivion was rendered weaker than ever before,[UOL 2] and great enemies who had long coveted the mortal plane decided to act upon their avarice. In 1E 243, the Alessian Slave Rebellion came to a head, and the armies of man, led by Morihaus, took the White Gold Tower. Though the Ayleids lost their Tower, it did not fall. Rather, the legend of Saint Alessia and her new Covenant with Akatosh began. It is said that her rebellion was blessed by Akatosh, who looked with pity upon the plight of her people. He drew his own blood and blessed Alessia with it, forging their pact: so long as Alessia's generations were true to the dragon blood, Akatosh would endeavor to seal tight the Gates of Oblivion and deny the armies of Daedra and undead to their enemies. In token of this Covenant, Akatosh gave to Alessia and her descendants the Amulet of Kings (whose centerpiece was the Chim-el Adabal), as well as the Dragonfires of the Imperial City. So long as the Empire maintained its worship of Akatosh and his kin, and so long as Alessia's heirs bore the Amulet of Kings, Akatosh and his divine kin would maintain a strong barrier protecting the mortal plane. It was a miraculous victory for all mortalkind, and perhaps the true significance of this victory is still not fully understood. But nevertheless, Tower One was left without a Stone. Like Red Tower, White-Gold was apparently left defunct. Further, this would not be the only Tower to fall to Dagon's onslaught. The white interior of the tower was said to radiate light. 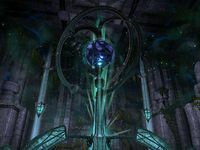 The Stone of Crystal-Like-Law is Transparent Law, which was broken apart at some point in the early Second Era by the Psijic Ritemaster Iachisis. An outsider used the divine power of the Dawnbreaker to reforge it in 2E 583. The Tower is said to exist in every single plane of reality simultaneously. For the people of Summerset, the tower was the heart of their homeland, a heart which was ripped out during the Oblivion Crisis. 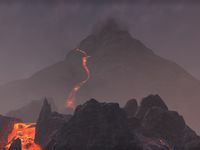 Before Martin Septim could close shut the jaws of Oblivion, the hordes of Daedra attacking the homeland of the Altmer were able to use magic to topple their tower. Crystal-Like-Law had fallen. However, appearances may be deceiving, for this bastion of sorcery seemingly transcended normal conceptions, existing in many planes other than Mundus. The Prophecy's reference to the Snow Tower has been widely construed as referring to the plight of Skyrim during the Stormcloak Rebellion, wherein High King Torygg was killed and the province was launched into a bitter civil war. The Bosmer did not build a Tower, they grew it, a great graht-oak whose roots sprang from a Perchance Acorn. This was their Stone. And because the Acorn might perchance have been elsewhere, thus was Green-Sap manifold and several. And each could walk, and sing their own songs. From the interplay of the manifold Green-Sap, the Bosmer learned the songs which "made the trees dance", and which dances they desired to perform. In other words, each Green-Sap was able to tell sing their own song, tell their own story — create their own reality. And the Bosmer took joy in this, and in picking the song which appealed to them, as it was a reflection of their own nature. Each Green-Sap was also every Green-Sap. Within each were told all the stories of the Green, with every ending true, though none any truer than another. When the Alessian Slave Rebellion caused Ayleids to flee Cyrodiil, a great amount of them were welcomed by the Bosmer of Valenwood, so long as their cousins agreed not to dissonate the greensong of Green-Sap. All agreed to this, save the arch-mage Anumaril. Before the taking of the White Gold Tower by Morihaus during the Alessian Slave Rebellion in 1E 243, Anumaril "fangled" a Staff of Towers, which was composed of eight segments, each one a semblance of a Tower in its Dance. White-Gold Knights took seven of these segments and carried them off to hide them in distant Fold-Places. Anumaril left with the eighth, disguised as a femur - this was Segment One, a semblance of Tower One, and thus also a reflection of Tower Zero. When Anumaril fled to Valenwood, he still carried with him Segment One. He asked the Great Camoran to show him Green-Sap, and was brought to one that by happenstance stood then in Elden Root. There, he found a Perchance Acorn. To this golden nut, Anumaril showed the segment. For the first time, the greensong knew only one ending. And so, that ending became definite, and the Perchance Acorn became a Definite Acorn. That Elden Tree would not walk again. This tree, also called the First Tree, or the Great Tree, is found in the Elden Grove. Life itself seems to be stronger around it, and it is believed to be the tree that seeded all of Valenwood. As written in an Ayleid prophecy, "All things to the Tree. From the Tree, all things". Using his dentition as tonal instruments, Anumaril dismantled his bones and built of them a Mundus-machine that mirrored Nirn and its planets. And when he had used all his substance in fangling this orrery, the Orrery of Elden Root, he placed the segment-sceptre within, hiding it between the Moons. Through these efforts, he had hoped to convert Green-Sap into White-Gold, and thereby remake the Ayleids' realm. But Anumaril's plan went awry for reasons he could not have anticipated. His Ayleid magic was concerned with "Will, and Shall, and Must—but under Green-Sap, all is Perchance". According to legend, if any person stepped into the center of this orrery when it was activated, it would reveal their inner self. Prince Naemon, younger brother to Queen Ayrenn of the Aldmeri Dominion, learned this lesson well shortly before his death circa 2E 582. After betraying his sister and entering the orrery, he briefly glimpsed a vision of the White Gold Tower, and then found himself painfully transformed into some sort of monstrous ogre. He flew into a rage and was quickly killed. Anumaril's plan did not necessarily fail, as his machinations presumably continue. So, while the ending to the story of Green-Sap is determined, that ending still remains a mystery. For some Towers, though, their ending has already come and gone, but the mystery remains. Orichalc is one of the most mysterious of the Towers; little is known beyond the name. [UOL 2] Some Redguards venerate Diagna, the "Orichalc God of the Sideways Blade", an avatar of the HoonDing which managed to "achieve permanence" and thus entered into the pantheon of the Crowns. The Stone of Orichalc was a sword. [UOL 4] It is suspected that Orichalc was found in Yokuda, and may have been related to the Lefthanded Elves. With Yokuda thought to be gone, this Tower may be gone, as well. Circa 2E 583, while aiding the Psijic Order in restoring the Staff of Towers, the Augur of the Obscure described it as an "ugly, sunken, long-forgotten [thing]" when the Soulless One found the fragment associated with this Tower. This commentary lends credence to the theory that it sank with Yokuda, although the Augur was regarded by the Psijics as a notorious liar when it was not being asked a direct question. In Walk-Brass, also called the Brass Tower and the Brass God,[UOL 5] the Dwemer sought to make their own god. Their ambulatory, usually anthropomorphic Tower is better known to most as Anumidium, the Prime Gestalt, the divine skin. [UOL 2][UOL 5] The book Divine Metaphysics is an explanation of how the Dwemer planned to make this new god using Kagrenac's tools and the sacred tones of the Heart of Lorkhan. Pieces of the golem, called Numidium, fell into the hands of the Tribunal, who eventually traded them to Tiber Septim as part of their Armistice with the latter's Empire in 2E 896. 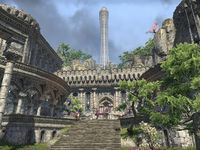 In the town of Rimmen in Elsweyr, it was slowly reassembled and finally activated. Though it was meant to be infused with the Heart of Lorkhan, Tiber's Battlemage Zurin Arctus devised a way to create the Mantella to function as the Numidium's heart. This was a mere copy of Anumidium and not as effective, but Tiber was still able to conquer the whole continent, becoming the first Emperor of Tamriel and ending the Second Era. This copy was used again in 3E 417 to bring about the Miracle of Peace in the Iliac Bay region, but it was apparently destroyed in the process. These successes served as inspiration for a new golem, known as Akulakhan or the Second Numidium, which Dagoth Ur was building beneath Red Mountain as part of his plan to drive the foreigners out of Morrowind and then conquer Tamriel. Like Anumidium, Akulakhan was to be powered by the Heart of Lorkhan. When the Nerevarine freed the Heart from Kagrenac's bindings in 3E 427, this Second Numidium was destroyed. ^ Due to gaps in the source material and the abstruse nature of the subject, much of the above is based on little more than educated guesswork, notably the Snow Tower's association with the Throat of the World and Orichalc's association with Yokuda. The Doomcrag in Rivenspire is believed to have been a failed imitation of a Tower. ^ Darius' dialogue in Morrowind. ^ Janand Maulinie's dialogue in Morrowind.